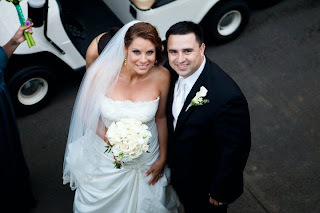 always underfoot: Patricia & Oscar: MARRIED! i have had the pleasure of working with the sweet and beautiful Patricia. she has been in my top 3 clients because she was SO easy to work with and for some reason loves my work so she gave me a lot of creative freedom. when the wedding invitation suite was completed, i met her fiancé for the first time. he was so sweet and attentive, and i was so excited for them to be getting married. what a great couple! 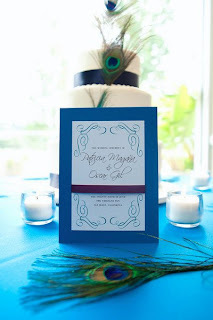 they chose to plan their wedding around the color teal with plum purple accents. YES! i love, love, love rich colors. this was so much fun for me to work with. they also wanted to incorporate peacock feathers. i included one on the back of the RSVP postcard and also squeezed one in on the directions page, which was the back of the map. all finished. this is what was pulled out of the envelope. i love that they had me include real peacock feathers! the lovely ladies of Taylored Occasions referred Patty to me. They were featured on the blog Mint Condition and a picture of the program I made to coordinate the invitations made it onto the blog. I’m pretty excited about that. click here to read the article. the happy couple! best wishes Patty and Oscar!